Cookie Chanel—owner of the chic clothing store It’s Vintage Y’All in Sugar Creek, Georgia—has been hired to dress models for a fashion shoot. The spread will be featured in Fashion and Style magazine's October issue—so the models are posing in a cemetery. As someone who can see and talk to ghosts, Cookie's not spooked by the location. But she is surprised when a new ghost appears, decked out in 1920s couture. And she's shocked when she hears a gunshot. Then a model runs toward her, saying the grumpy photographer has been edited out of the picture – for good. With help from her ghostly pals, Cookie must zoom in on the truth before she’s the next to strike a final pose . . .
Rose Pressey is a USA Today bestselling author. She enjoys writing quirky and fun novels with a paranormal twist. 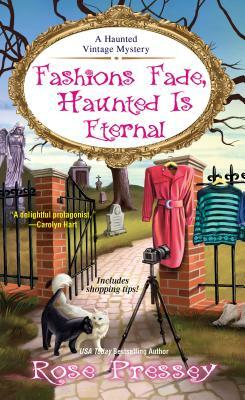 Her Haunted Vintage mystery series includes If You’ve Got It, Haunt It; All Dressed Up and No Place to Haunt; Haunt Couture and Ghosts Galore; If the Haunting Fits, Wear It; Haunted Is Always in Fashion; and A Passion for Haunted Fashion. When she’s not writing about ghosts and other supernatural creatures, she loves eating cupcakes with sprinkles, reading, spending time with family, and listening to oldies from the fifties. Rose lives near Louisville, Kentucky, with her husband, son, and three sassy Chihuahuas. Visit her on Facebook, at www. rosepressey.com or at www.itsvintageyall.blogspot.com.